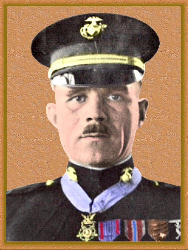 With his advancing units facing great resistance, swam River Meuse canal and personally led the attack to success establishing a bridgehead. 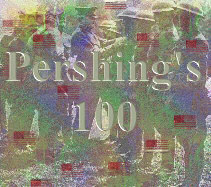 Although severely wounded by shell explosion which buried two companions at Cantigny, he promptly dug them out and carried them to aid despite heavy enemy fire. Read an article about the Battle for Cantigny. After advancing 2 kms into enemy territory on reconnaissance mission and finding his patrol almost surrounded fought on despite fatal wounds and drove the enemy from an important position. Acting alone and under fire, circle behind enemy machine gun nest, eliminated it and captured 23 German soldiers. With Jesse Funk [below] made two trips with stretcher into No Man’s Land to rescue patrols caught in open, rescuing two. Silenced two enemy machine guns that were hindering his unit’s advance. Read about the Battle for Blanc Mont Ridge. Killed after volunteering to carry a message calling for reinforcements for his nearly surrounded platoon. Captured three machine guns and thirty prisoners after being wounded. Fatally wounded in the face while his unit was being relieved, he continued guiding the way to the new position despite heavy fire. Died the next day. Twice captured enemy machine guns taking survivors prisoner on the same day. 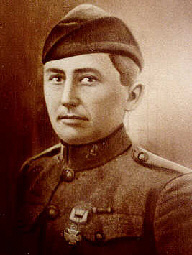 Wounded early in the initial assault at St. Mihiel, he continued fighting and eliminating machine guns all day long refusing to be evacuated until late at night. Crawled several hundred yards under enemy fire to carry essential message to the regimental PC. Rescued his tank commander under intense machine gun and shell fire carrying him over a mile to safety. Killed after volunteering to bring machine gun ammunition forward over exposed ground. Entered a dugout alone after seeing enemy soldiers entering it and captured 12 of them. After leading a successful advance across a stream waist deep, was shot in abdomen by sniper and later died. Silenced an entire nest of machine guns ambushing his fellow soldiers. Later killed in action. Led a successful advance with his automatic weapons team under terrific enemy fire, continuing after receiving fatal wounds. After crawling behind enemy lines, eliminated a machine gun crew with his bayonet, then eliminated another strong point with hand grenades. Arkansas’s most decorated Doughboy. Read about his accomplishments by clicking here. Advanced over open ground in an individual assault on a machine gun which he silenced despite being wounded. 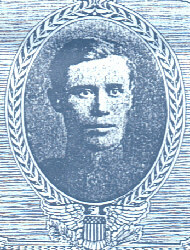 Although wounded in head, body and legs, when orders came for another assault, he continued leading his company in the next assault until he fell dead. 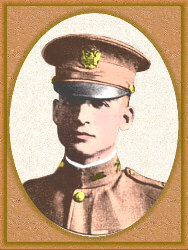 Killed while eliminating an enemy machine gun after rushing alone over 100 yards of open country. Died on the field after single-handedly eliminating a machine gun position holding up his units’ advance. or toMike Iavarone (mikei01@execpc.com) regarding form and function.